• Refuse is collected once a week. • If a holiday falls on a weekday or Sunday, collection may be delayed by one day. (Holidays that may affect service are New Year’s Day, Memorial Day, 4th of July, Labor Day or Christmas Day). • Village Ordinance designates when refuse, yard waste and recycling can be placed at the curbside. • Refuse, yard waste and recycling shall be placed at the curb no later 6:30 am on the collection day. • Refuse, yard waste and recycling shall be placed at the curb no earlier than 5:00 pm the night before collection day. 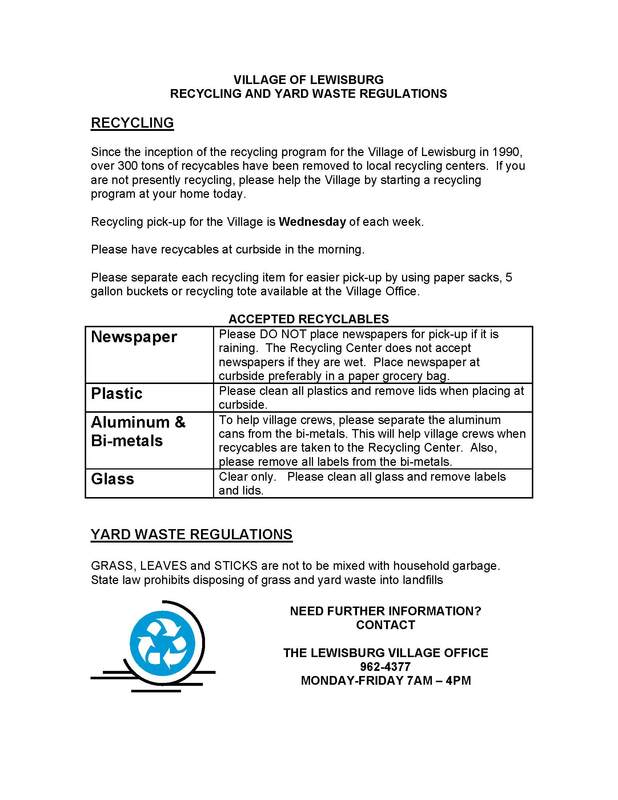 • If properly placed materials have not been collected by the end of the regularly scheduled collection day, please call the Village of Lewisburg offices within 24 hours. • If refuse, yard waste and recycling are not curbside for the regularly scheduled collection day, Village staff will collect the materials on the next scheduled collection day, the following week. Refuse Utility Rates can be located under the Village of Lewisburg's Water & Sewer Department webpage. Thank you. GRASS, LEAVES and STICKS are not to be mixed with household garbage. State law prohibits disposing of grass and yard waste into landfills. 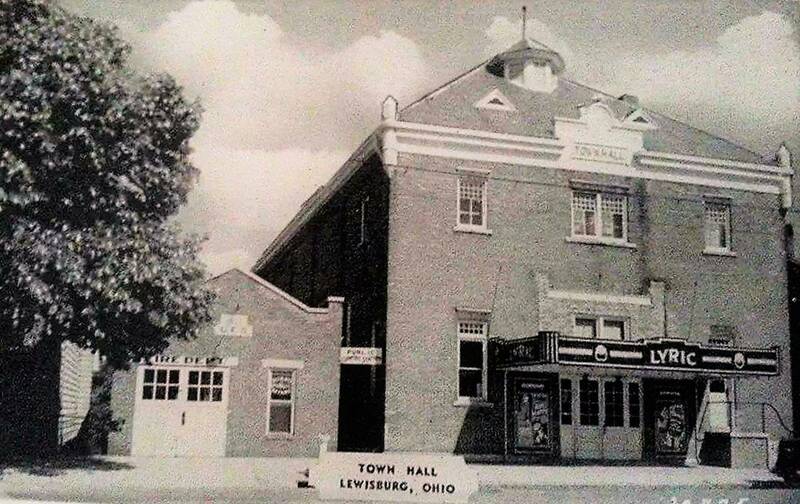 Since the inception of the recycling program for the Village of Lewisburg in 1990, over 300 tons of recycables have been removed to local recycling centers. If you are not presently recycling, please help the Village by starting a recycling program at your home today. • Recycling pick-up for the Village is Wednesday of each week. • Please have recyclables at curbside in the morning. • Please separate each recycling item for easier pick-up by using paper sacks, 5 gallon buckets or recycling tote available at the Village Office. Please DO NOT place newspapers for pick-up if it is raining. The Recycling Center does not accept newspapers if they are wet. Place newspaper at curbside preferably in a paper grocery bag. Please clean all plastics and remove lids when placing at curbside. To help village crews, please separate the aluminum cans from the bi-metals. This will help village crews when recyclables are taken to the Recycling Center. Also, please remove all labels from the bi-metals. Clear only. Please clean all glass and remove labels and lids. Trash Totes are available at a cost of $80 per tote. We can bill your utility account in full or two half payments. Please call the Municipal Office at (937) 962-4377 or stop by the Office to request your tote.